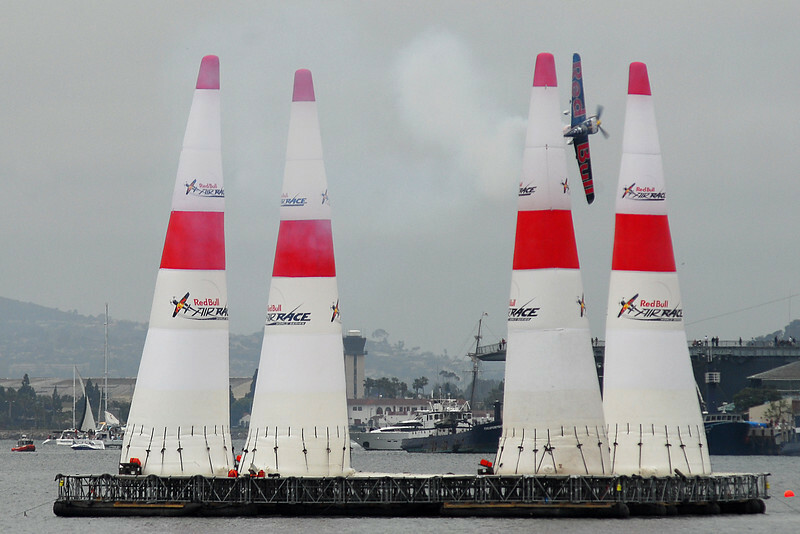 The Red Bull Air Races took place the first weekend in May. With the exception of it being, for the most part, an overcast day, it was definitely something to behold. The way the pilots navigate the course with the precision and speed that they do is amazing and must be seen to believe. Pylons full of air are set up in the bay area between Coronado Island and the Seaport Village/Embarcadero. They have to corner around the pylons, then go in between them in an obstacle course fashion. There are small sharp edges on the end of the wings so if they get too close, they will puncture a pylon and lose points. These photos are from the day of the finals and were shot from Coronado Island looking towards downtown San Diego. The overcast sky does nothing for the background, but it is about the planes and pilots anyway. He makes is through the quad and makes that sharp turn to come back around.